Does the choice of suture material matter in anterior and posterior colporrhaphy? The optimal suture material in traditional prolapse surgery is still controversial. Our aim was to investigate the effect of using sutures with rapid (RA) or slow (SA) absorption, on symptomatic recurrence after anterior and posterior colporrhaphy. 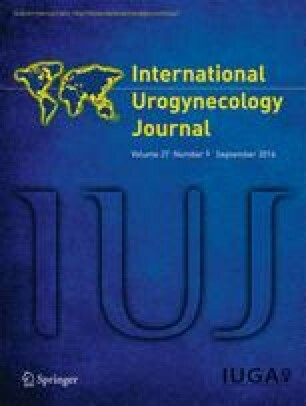 A population-based longitudinal cohort study with data from the Swedish National Quality Register for Gynecological Surgery. A total of 1,107 women who underwent primary anterior colporrhaphy and 577 women who underwent primary posterior colporrhaphy between September 2012 and September 2013 were included. Two groups in each cohort were created based on which suture material was used. Pre- and postoperative prolapse-related symptoms and patient satisfaction were assessed. We found a significantly lower rate of symptomatic recurrence 1 year after anterior colporrhaphy in the SA suture group compared with the RA suture group, 50 out of 230 (22 %) vs 152 out of 501 (30 %), odds ratio 1.6 (CI 1.1–2.3; p = 0.01). The SA group also had a significantly higher patient satisfaction rate, 83 % vs 75 %, odds ratio 1.6 (CI 1.04–2.4), (p = 0.03). Urgency improved significantly more in the RA suture group (p < 0.001). In the posterior colporrhaphy cohort there was no significant difference between the suture materials. This study indicates that the use of slowly absorbable sutures decreases the odds of having a symptomatic recurrence after an anterior colporrhaphy compared with the use of rapidly absorbable sutures. However, the use of RA sutures may result in less urgency 1 year postoperatively. In posterior colporrhaphy the choice of suture material does not affect postoperative symptoms. The authors thank Lina Benson at the Department of Clinical Science and Education at Södersjukhuset for support with the statistical analyses. The database was kindly provided by the Swedish National Quality Register of Gynecologic Surgery.